Character. Cost: 3. STR: 3. Reaction: After Dornish Paramour is declared as an attacker, choose a character controlled by the defending player. That character must be declared as a defender for this challenge, if able. Character must be standing in order to be declared. Character must have appropriate challenge icon in order to be declared. 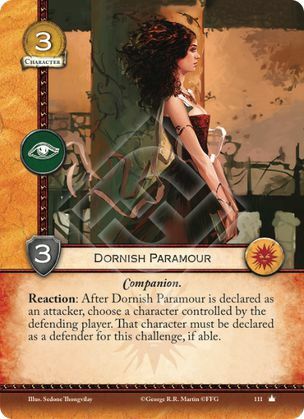 If Dornish Paramour is used in combination with the plot Jousting Contest, then the defending player must declare the Paramour's target -- and only the Paramour's target. Also, the ability only "kicks in" when you reach the framework for declaring defenders. For example, if you target Margaery Tyrell, it's perfectly legal for Margaery's controller to use her ability in the action window between declaring attackers (when Dornish Paramour is triggered) and declaring defenders (when Margaery would have to defend if able).